The tileset provided for The Witchlight Fens gets a lot right. It does a fine job of capturing what I think are the relevant features of the location. There is a nice combination of wetlands, difficult terrain (both wet and dry), rock formations and vegetation. The tiles look like they would be easily utilized to represent the feel of the place, as well as offer a good opportunity for interesting and dynamic combats. There are two bridges, two large swamp dwellings and lots of interesting features. My one gripe is that the only boat tile offered is 1×2 which could hold 2 medium creatures. I’d have liked a 2×4 or even 2×3 boat tile such that the entire party would fit as they pole their way through the swamp waters. The only use of the boat that I can imagine is for an enemy, NPC or for window dressing. I’d have liked to have a boat on which to stage a combat, an ambush, or a skill challenge. The other notable design feature of the tileset is both good and bad. The colors used on this tileset will allow you to easily introduce tiles from the D&D Tiles Master Set: The Wilderness. The greens are very similar and incorporation of tiles from both sets into a single map will work well. 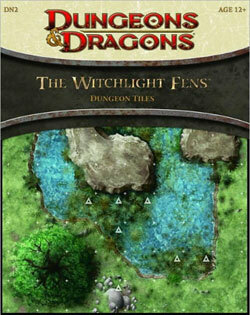 The downside to this is that The Witchlight Fens are a bit TOO cheery and bright. I imagine The Fens to be darker, dank and a miserable place, crickets and frogs constantly groaning in the background as mist swirls around the area. I recognize however that to design them this way immediately limits their utility for anything other than deep dark swamp. With the current design, they work well enough for swamp, as well as being useful for general wetlands, flooded woodlands or even coastal areas. All in all, I think this is a really nice tileset from WotC and one I will almost certainly use for multiple locations. I think the price point would be better at $10 but I don’t begrudge them that. It’s a useful product and I’m glad to have it available on the market. Just be careful if you think you may want these. WotC tilesets (not including the master sets) are notorious for single print runs which means stocks won’t last long and if you eventually need them, you’ll be stuck on ebay paying a nasty markup. Go grab these tiles now if you think you may want them in 6 months or more because by then, they’ll likely be out of print and hard to find, just like the early WotC tiles like Ruins of the Wild, Dire Tombs and Streets of Shadow.